This Knowledgebase article provides information about the automatic switchover process and how to trigger a manual switchover. A switchover can be triggered, automatically or manually and can only occur if the system is fully synchronized. Switchovers cannot be performed if either the active or the passive servers are in an unsynchronized or unknown state. The server's synchronization status can be viewed from the 'Neverfail Heartbeat Management Client' -> 'System Status and Control' screen. The Server Pair's Registry Status AND File System Status must report as 'synchronized' for any kind of switchover to take place. It is also important to review the queue information before triggering a manual switchover. If the active and passive server queues are large, and file operations on the active server are high, Neverfail recommends waiting to perform the switchover until the queue clears. The screen will indicate manual or automatic switchover progress. A manual switchover may be used to perform maintenance on the Primary Server. Open the Neverfail Heartbeat Management Client. Check the queue information for any signs of large queue operations on the System -> Status & Control screen. If queues are small, click the Switchover button on the 'System Status & Control' screen. This reverses the role of the servers; the active (Primary) server will now become the passive server and the passive (Secondary) becomes active. Following maintenance, you can again trigger a switchover by clicking the Switchover button causing the active (Secondary) server to become the passive server, and the passive (Primary) server again to become the active server. An automatic switchover will occur, for example, when a monitored protected application has failed. 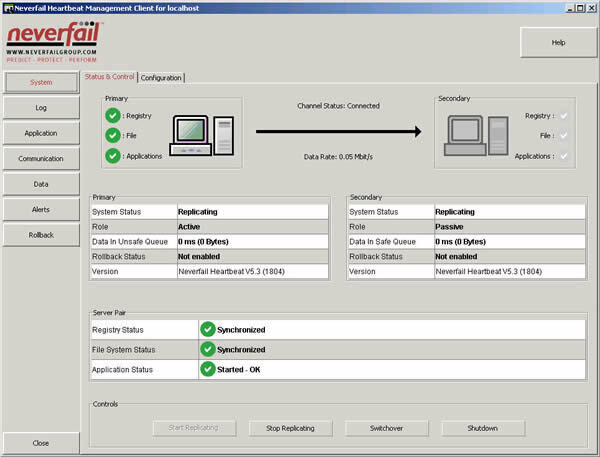 The 'System' 'Status & Control' screen of the Neverfail Heartbeat Management Client will indicate the status of this process. Protected applications are stopped on the Primary Server. Once the protected applications have been stopped, no more disk updates are generated. All updates that are still queued on the active server are sent to the passive server. After this step, all updates are available on the passive server. The status of the active server changes to ‘switching to passive’. The server will now no longer be visible from the network. All queued updates are applied on the passive server. The role of the passive server changes to active. After this step the newly active server will start intercepting disk I/O’s and queue them for the new passive server. The new active server will now be visible on the network with the same identity as the old active server. The old active server status changes from ‘switching to passive’ to passive, the new passive server will now accept updates from the new active server. Protected applications are started on the new active server. The protected applications will now start generating disk updates.